I had hoped to have uniforms and webbing done but I was only using a standard sized brush (about a size 0 or 1) – the uniforms took somewhat longer to paint than expected (memo to self: “self – get a couple of bigger brushes … when you get a job”). 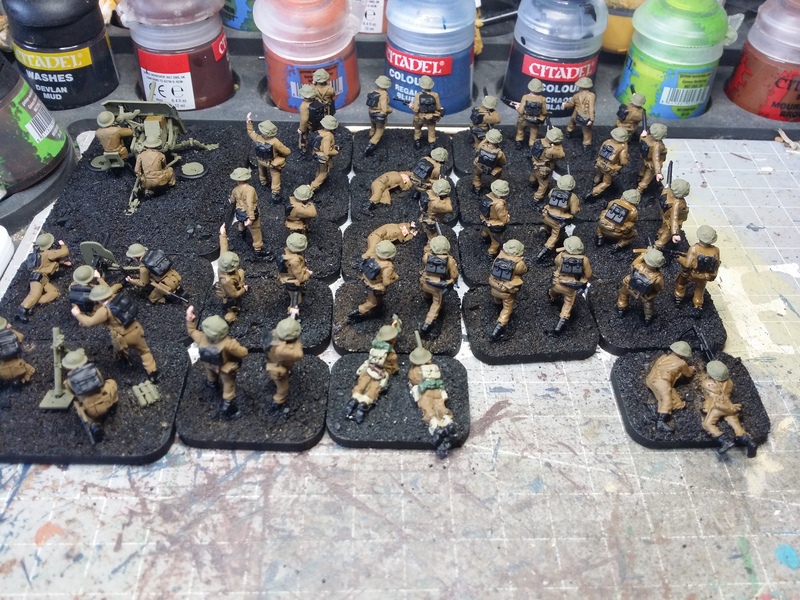 Uniforms painted – now starting to look like soldiers. Next up – webbing and other impedimenta. Then wash, highlight and lastly pick out the weapons. what colour did you use ? Why, you like that colour or too dark? Yeah – before washing it looks a good flat brown. After washing it darkens (of course) but a dry brush of the same colour over the top appears to have lightened it a bit again.